My reason for advising them to avoid this place is because there are a lot of complaints from people who stay there. As Joanna said, it's not all that clean and there are also reports the owner is mentally unbalanced. It's just for three days and we're going to try it. If it's all that bad, we can always move to the Salem Hotel & Marina, where Lee and Julia are staying, unless it's full. We want to try it because it was standing when the witch trials took place and some of the rooms are decorated sort of like they were in the 17th century. It's supposed to be haunted by a ghost cat and people who have stayed there have felt a presence in some of the rooms and felt that they're being watched. I think it will be fun. It will be an adventure. I would try it too! 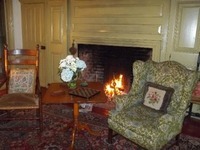 I want to stay there because, like Catherine said, the house dates from the time of the Salem Witch Trials. But I'm also having second thoughts. I keep thinking that maybe Lee and Julia are holding something back. I can't explain why I think that, I just do. You're paranoid, Kate. Why would anyone hold something back? Do you think they want to play a joke on you, or something? If I were going, I think I'd like to stay in the house instead of in an impersonal hotel or motel. If any of you can find some photos of it, please post them. Here are some photos of the Stephen Daniels House. They aren't all that good, but they will give you an idea of what it's like. Looks old, dusty and musty. It may be just as bad as we've been told, but we're going to try it anyway. The house was there when people were being accused, arrested and executed for witchcraft. That alone makes it interesting. There's just something irresistible about staying in a place where people who were actually there when the witch trials were going on lived. People were scared that they might be accused and they might have known some of the accused or those who were hanged because Salem wasn't all that big back them. The house is also said to be haunted. Whose to say the ghost isn't someone who lived there during the witch trials? We've had another minor change to our plans. Instead of staying 3 nights in Salem as we had first planned, we're staying only 2 nights. The Black Point Inn, where we're staying in Maine, offered us a better deal if we stayed 6 nights instead of the 5 like we'd planned. Also, we were having second thoughts about the Stephen Daniels House, but even if it's as bad as some people have said, we will be there for just 2 nights. 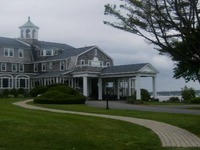 Here's a photo of the inn where we're staying in Maine. It's right on the ocean and there's a cliff path that runs along the cliffs and beach. I think that two nights are enough in Salem because we've been there twice before. Maine is always my favorite part of our trips. I love Salem, but I think that I enjoy our time in Maine more. What a beautiful place. Is it haunted? It looks like it should have a ghost. I look forward to your Dark Shadows trips every year because I love reading about the places that you go. Yes, it's haunted. Members of staff sometimes feel a presence, particularly during the off-season when there are few guests. People have heard phantom whispers on the third floor and children have reported encountering ghosts on the third floor. On one occasion, a child saw someone at a third-floor window when that particular room was empty. The building that used to be a barn is now used as a garage and at one time, staff lived in some of the second-story rooms. One man, a kitchen worker, is said to have hanged himself in the building after his fiancée broke off their engagement. Prouts Neck was once a favorite vacation spot with several inns; the one where we're staying is the only one that remains.